Key West Scuba Diving Does It Right! Most people think of Australia when considering reef diving, but you can get the same greatexperience much closer to home. Key West, located on the southern tipof Florida, offers the only live coral reef diving opportunity in the United States. When the winter weather has left you feeling chilled, a Key West scuba diving adventure can warm you to the core with 80-degree water, beautiful beaches, palm trees, and all the amenities. Lost Reef Adventures Key West scuba diving packages include everything you need for that perfect Key West SCUBA diving experience. Fresh water showers, restrooms, gear storage, and photo tables to protect your cameras and video equipment are just the beginning for your Key West scuba diving holiday. They offer custom charters, scuba diving instruction and some of the most stunning reefs you could imagine for scuba diving and snorkeling. Your Key West scuba diving adventure will change your life forever. 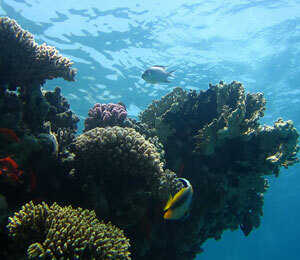 You will be astounded at the brilliant colors and immense size of these living corals reefs. As you explore, you will find yourself accompanied by playful dolphins, curious sharks, elusive red snapper, immense schools of exotic tropical fish, and the occasional sea turtle, whose size and majesty alone will astound you. There are over 300 species of tropical fish that you will experience during your Key West scuba adventure. Your Key West scuba diving trip wouldn't be complete without a wreck and reef dive. The Florida Keys are home to countless shipwrecks that simply beg to be explored and photographed. One such wreck, the Joes Tug, was sunk to create an artificial reef. This 75-foot tugboat looks surreal as it offers shelter to tropical fish, coral and anemone. Another artificial reef component, the Cayman Salvager, anchors its 180-foot steel body in 75-feet of water, an immense artifact of bygone days. The Aquanaut is another amazing Key West scuba diving must-see. This 55-foot wooden tugboat sank into 75-feet of water in 1967. At this location, you are bound to discover shrimp, yellowtail snapper, crab, and lobster. Unlike the Maine lobster, with its huge claws, the Spiny Lobster is savored for its delicious tail. Tourists and locals join in the Key West scuba lobster catch each year, armed with tickle stick, gloves, underwater measuring tool, net, catch bag, and dive flag. You can also catch your quota of lobster while snorkeling. Just be sure to get your permit. Your Key West scuba dive will be as delicious as it is beautiful as you tease your lobster out from under rocks and try to get your catch bag around your prey as it scuttles across the ocean floor. The sights, smells, sounds and rhythms of Key West will lull you into a state of utter relaxation and ease. Your Key West scuba diving charter will provide just the right amount of activity and excitement to get you ready for a great evening out on the town. Palm trees and pristine beaches invite you to take a romantic stroll. After you have rested and relaxed enough in Key West, you may want to show off your tan and your great smile on a Cabo fishing trip in Mexico, a Key West para sailing excursion, or a bahamas dolphin encounter holiday once your adventure begins you will never wan it to end!